The Walkersville Southern RR north of Frederick, Md. took delivery of its third GE 44-tonner on Dec. 6th. The loco, former Great Northern 5201 (c/n 12911, Sept. 1940) and later GN 51, is alleged to be the oldest surviving example of the model, the fourth built (after sister GN 5200, CB&Q 9103, and CMStP&P 1690). In Dec. 1954 it was acquired via dealer Bateson-Stolte of Augusta, GA to A J King Lumber of Sevierville, TN for their subsidiary Smoky Mountain Railroad between Knoxville and Sevierville, Tennessee (not to be confused with today's Great Smoky Mt. RR out of Dillsboro, NC), to replace the line's steam locomotives. It operated there as the line's sole diesel until the line suspended operations due to poor track conditions in January 1961. The loco was last stored derelict at an industrial park in Fletcher, NC, where it had been occasionally used as a switcher by a trucking company, before being acquired in 2017. The loco joins former PRR 9339 (acquired from the South Carolina RR Museum in August 2011) and 9331 (acquired from the Strasburg RR in May 2013), both owned privately. The WSRR is operated on part of the former PRR Frederick, Md. branch from York, Pa., which was one of the few locations in the nation where a Class One railroad actually assigned 44-tonners on a regular basis, due to light rail, light traffic, and street running in Frederick. Photo from the RR's Facebook page. Last edited by Alexander D. Mitchell IV on Thu Dec 07, 2017 11:47 pm, edited 2 times in total. Wow! A remarkable find, being derelict for what, 56 years if I read the timeline correctly, sidelined at only age 21. I believe this unit replaced the worlds smallest standard gauged 4-6-2 on the Smokey Mountain RR, #110 which is now in service in Michigan. There's a bit of a confusion in the wording, it was last used at an industrial operator, who parked it derelict 5 years ago. In that time, it did suffer from copper thieves, but nothing close to what 56 years of abandonment would do to it. This IS great news! Three of Smoky Mountain's steamers were saved, and now their diesel! Quite a remarkable legacy for a little backwoods short line railroad. It appears that the mover was Dave Tunison. He hauls the Gramling locomotives. You can tell by the exhaust stack on the tractor ......only one I've ever seen like that. There's a bit of a confusion in the wording, it was last used at an industrial operator, who parked it derelict 5 years ago. The "confusing" wording (since updated for the third time) reflects both discrepancies and omissions in several various accounts of the loco's history between 1961 and 2017. I even stopped across my fair city at another "critter tracker" to check his records, and found yet another variation in the supposed timeline. Let's just say there are a couple variations of the history between 1961 and 2017 and leave it at that. Now, as for the cabooses that were behind it (SR bay-window X350 and N&W cupola 518619)............????????????? 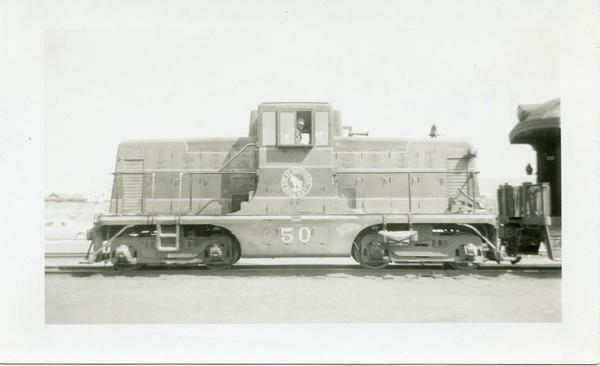 To be precise, the locomotive was not acquired by the WSRR but rather by a private individual who also owns the two ex-PRR GE 44-tons on the property, as well as just about every piece of MoW equipment that can be seen at the railroad. Much of the rolling stock is owned by individuals or groups other than the WSRR. Actually, the title of this thread says "Walkersville Southern RR Acquires third GE 44-tonner"
So out of these three 44-tonners, which work and presently run? If memory serves me correctly, 9339 works, 9331 works or is close to working - and I can't imagine this one not being restored to working order if the other two work. Is that information correct? A discussion on the O-Gauge forum (LINK) says that both GN #50 and #51 were painted in the two-tone orange & green scheme. A photo from that forum shows #50 switching the Helena, Montana, passenger station. If you want to get pedantic about it, the forum standards doesn't allow me enough room to write "Private Operator Acquires Ex-GN GE 44-Tonner And Ships It To Walkersville Southern" as a headline. Take it up with the website architects. Besides which, even the Walkersville Southern itself promotes such equipment as "theirs" even if it technically is owned by a member, shareholder, or whatever. If they can do it, so can I. Further, I really don't like publicly disclosing ownership of privately owned rolling stock for a variety of reasons, unless the person is an active limelight-seeker (see Ross Rowland, Bennett Levin, Andrew Muller, etc.). I wanted to respect the new owner's right to privacy. Our excursion operations, for better or worse, are chock full of privately-owned equipment operated under the flag or aegis of an excursion railroad or museum. I can even find you at least one "museum" that is legally speaking nothing more than a "parking yard" for privately-owned rolling stock. Now back to celebrating the good news instead of nitpicking. It occurs to me, given this latest acquisition's long period of inactivity, not to mention the paucity of parts available for 44-tonners, that it may have been acquired as a parts source for the other two 44-tonners. "Walkersville Southern Railroad and Museum It qualifies for state and National landmark under Criterion A and C .What agencies or companies used it and which sites it was assigned to might qualify it under Criterion B too. A member was asked to save the unit from scrap and let it live on, it was close to being dismantled. We agreed to transfer and to live on with 9331 and 9339. A lot of tests and inspections will be done to see if the unit can be save given all the damage that was done by copper thieves. We believe the damage is reversible. The engine was rebuilt in 1970 and very rarely used and appears to be a good candidate for restoration. Restoration costs will be the major concern. The unit began it's carrier as the fourth GE 44 tonner built in Sept 1940. It was for the Great Northern Railroad. GE Unit #12911 became Great Northern 5201, renumbered 51 in 1942. From what we can tell it started in Spokane Washington, then was leased to the Coeur D'Alene Railway, South of Spokane, when overhead electrical operations were abandon. See GN roster for all of its dispositions. It's second major assignment was working on the Smokey Mountian RR as unit 440. After the Railroad shut down. It was accidentally left in storage after rebuilding for many years until the White Transfer company discovered and bought it for there transfer company in Fletcher, NC. It has served the company until its removal yesterday. Copper thieved damaged the unit about 5 years ago, and it has sat ever since." They also responded to a question regarding paint "Walkersville Southern Railroad and Museum Our first choice will probably be to restore it back to GN51 in the later #51 paint scheme, a close second is to return it to Smokey 440. The GN green color is a match to our dinner train coach South Hampton. The orange would be colorful addition."